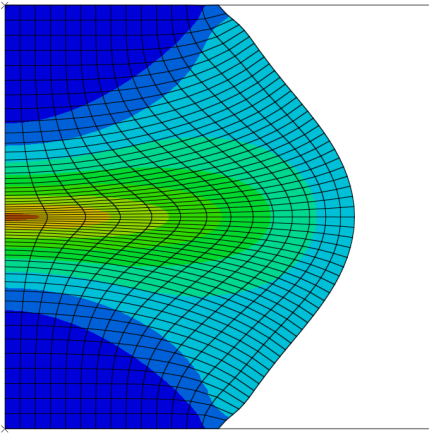 Finite element modelling of hot compression tests of Ti64, Ti-407 and Zr2.5Nb. The modelling aims to account for effects such as barrelling due to friction and temperature gradient, providing true σ(ε,ε ̇,T) for FE or microstructural modelling. Developing constitutive material models of Ti64, Ti-407, Zr2.5Nb and wrought Al alloys, testing the validity of, and sensitivity to, conventional empirical fits, such as the hyperbolic sinh/Zener-Hollomon equation, modified Johnson-Cook models; development of microstructure-informed finite element models. Experimental work to provide data for validation of the modelling, in collaboration with The University of Manchester. Finite element analysis of innovative processes for light alloys, such as friction welding, hot form quench (HFQ), and flexible forming. Figure 2. Mapping heat generation onto constitutive data in a material deformation map. Microstructure evolution models based on thermomechanical histories and microstructural data from real process or lab-scale tests (identifying microstructural state variables, initial microstructure, and its evolution as a function of temperature, strain-rate and time).